Create a personalized, printable class schedule in minutes. Canva’s free online class schedule maker is your shortcut to a schedule with style. Keep on track of your schedule with Canva’s class schedule maker. We’ve got thousands of class schedule templates that go beyond the typical table format. With options to suit every style, you’re sure to find a class schedule that suits your needs. Unlike other class schedule makers, our templates are fully customizable. That means you can change the text, colors, images and layouts until you’ve got the look you want. Got something specific in mind? It’s easy to design from scratch in Canva. Add background images, your favorite colors and the best fonts—all for free. Choose a class schedule template from Canva’s library. Add your classes to the table. Change the images, font, colors and more. Make your design unique to your personality and style. Print, download or share your class schedule. 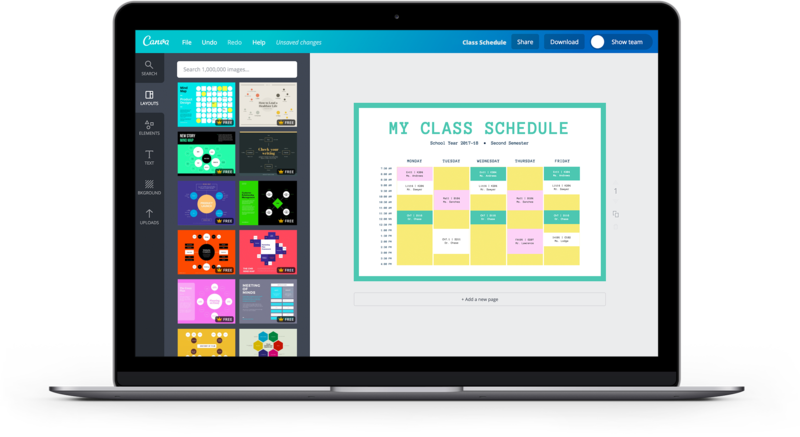 With Canva’s class schedule tool, you’ve got the flexibility to create a fully custom class schedule according to your tastes and needs. Delete the parts you don’t need, add the parts you want. Want a 7-day schedule instead of 5 days? Switch in seconds. Prefer to write the class full class name rather than the course code? With Canva, it couldn’t be easier. Add a personal touch to your class schedule. Upload your own photos and images to Canva for free! Choose any JPEG, PNG or SVG file from your computer and simply drag and drop it into your new class schedule. Canva also has an extensive image library. With over 2 million high-quality images to choose from, you can spice up your design with patterns, textures, wildlife photos, nature photos, sports or fashion photos — whatever inspires or motivates you! If you prefer a physical copy to place in your binder or locker, simply download your class schedule as a high-quality PDF and print. Maybe you want to share your schedule with your friends and loved ones. Go ahead and share it straight from Canva—you can share via email, send a link, or post to your Facebook or Twitter account. You can even embed your design on your website or blog! How can I format the text on my class schedule? You can edit your text a variety of ways to make sure it fits. With Canva’s text tools, you can change the font type, size, color, emphasis, alignment, spacing and transparency. Yes we do! Our diverse stock library includes over 2 million stock images, graphics and illustrations. And using your own images is 100% free. Once you upload them in Canva, you can use them as many times as you like. Do I need to download Canva to create a class schedule? Nope. Simply head on over to www.canva.com to start creating your class schedule. You don’t need to download Canva, just create an account and log in. If you want to design on the go, download our iPhone or iPad app. They’re free to purchase from the Apple store.